The Pronto Banner Stand is a simple retractable unit with instant setup. A quality banner stand at the most economical price. The Pronto Banner Stand supporting pole and graphic store in the base of the unit. When ready to display, simply attach the pole perpendicular to the base and pull the banner up to attach to the top of the pole. The Pronto is very conducive to use as a tabletop display, just assemble at one or two sections high. Live Area: Inches from top: Level 1: 29.25"; - Level 2: 56.25  Full Height: 86.25. Approximately .625 of graphic hides behind top hardware bar. 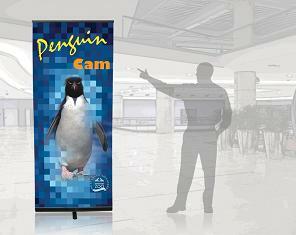 Total Banner Stand Height: 89.75. Units are available in black and silver. Each unit includes a black, padded canvas carrying bag with silver accents. Pronto may not be purchased without a graphic. Lambda Bright - Printed on a bright inkjet paper with sandwich 3 mil laminate. Dye Sublimation With Diamond Finish - Full color process printed on microknit fabric with laminate on back. Lambda Duraflex or Metallic - Printed on a plastic based substrate with sandwich 3 mil laminate.